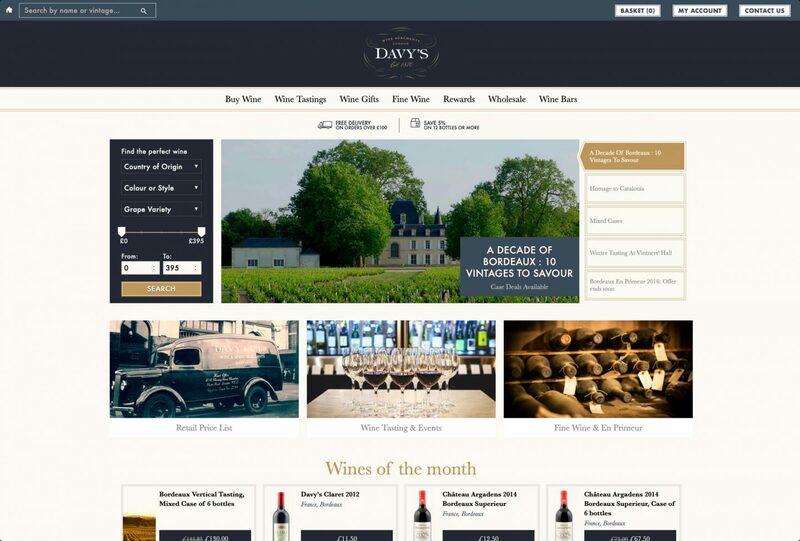 Davy’s Wine are an independent wine merchant, founded in 1870 by Francis Edwin Davy. Their heritage has allowed them to build up a unique relationship with some of the finest wine makers and Châteaux in the world. They now have over 20 stores and bars scattered through some of London’s most exclusive locations, each offering their own, individual experience. They also produce their own label wines and hold events such as wine tastings. Davy’s came to Strawberrysoup looking to have their site revitalised and rebuilt with the goal to increase conversions. We gave the website a full reskin to bring it up-to-date and make it more efficient. Reskinning the site started with refining brand elements before we moved on to restructuring the information hierarchy and fully optimising the backend to speed the entire site up. Using Davy’s existing brand typefaces, we cleansed the site of mis-matching styles. We then worked on a set of new styles for headings and paragraphs to maintain consistency and clear type site-wide. The most important part of the website to restructure was the product pages. Following tried and tested eCommerce user experience practices, we dramatically changed the product pages. We created a new content hierarchy, placing the key information and conversion point as high up the page as possible. Secondary information, including the detailed description, delivery information and returns details were moved further down the page and into a tabbed content block. eCommerce trust signals were made prominent further down the page to help convert any new or unsure users. 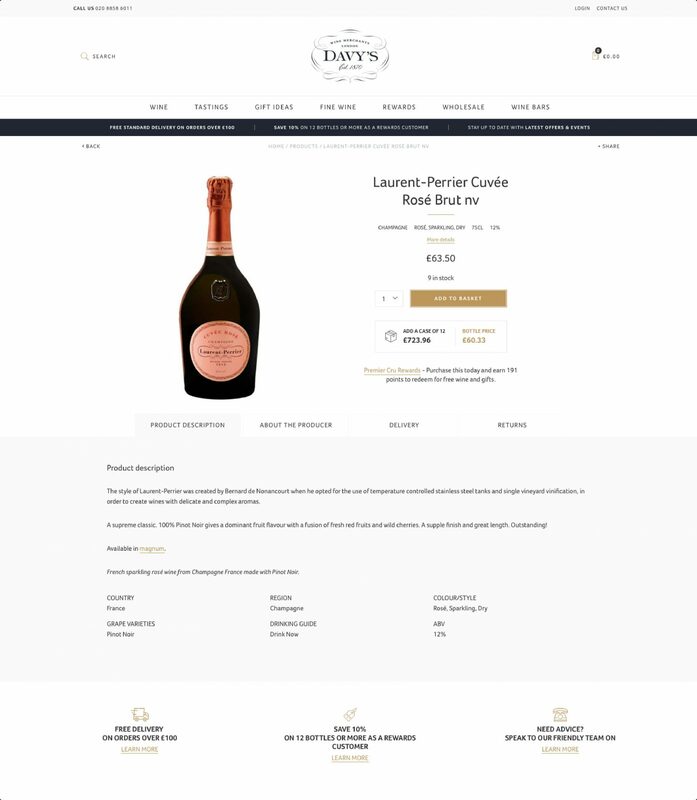 Highlighting the per bottle price of a case of 6 or 12 was an important requirement for the product pages in an effort to try to upsell bulk purchases and the discount to be had. 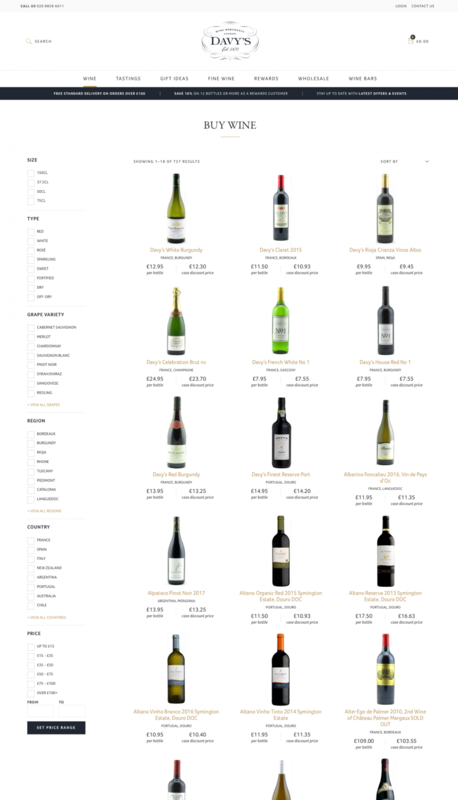 As part of the reskin, product filtering was revamped and utilised to its full potential. The design of the old site prevented the categories used for filtering to be used properly. The reskin accommodated all these filter categories housing them in a side filter system on the product list pages. Users can now quickly drill down to product types they’re interested in. With performance in mind, we rebuilt the sites template engine from the ground up. We replaced the old template engine with a rebuilt system. 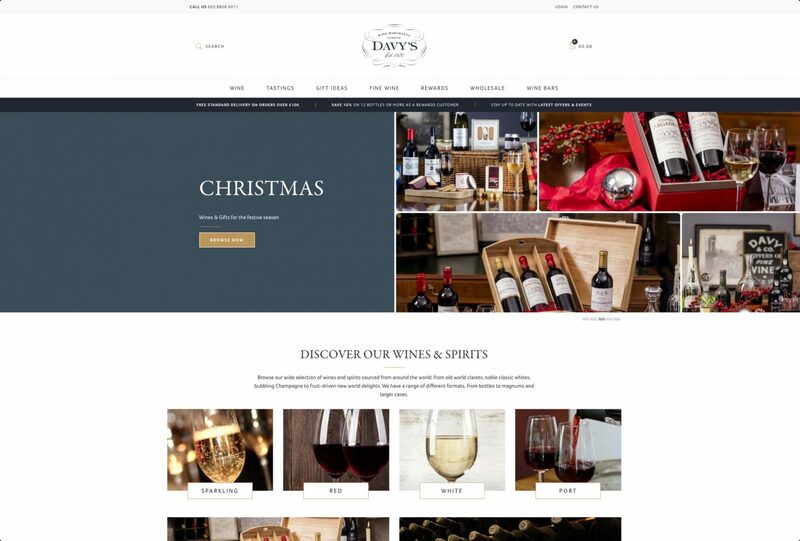 Our bespoke solution to enable page building improved performance on both the back and front ends of the website. We cleansed old templates, custom fields and outdated functions and replaced them with a new, flexible system. The new system uses repeatable flexible content layouts which can be reused around the site. This helped to improve performance site-wide and an upgrade from PHP5 to PHP7 supported this boost. 33% Increase in global completions.